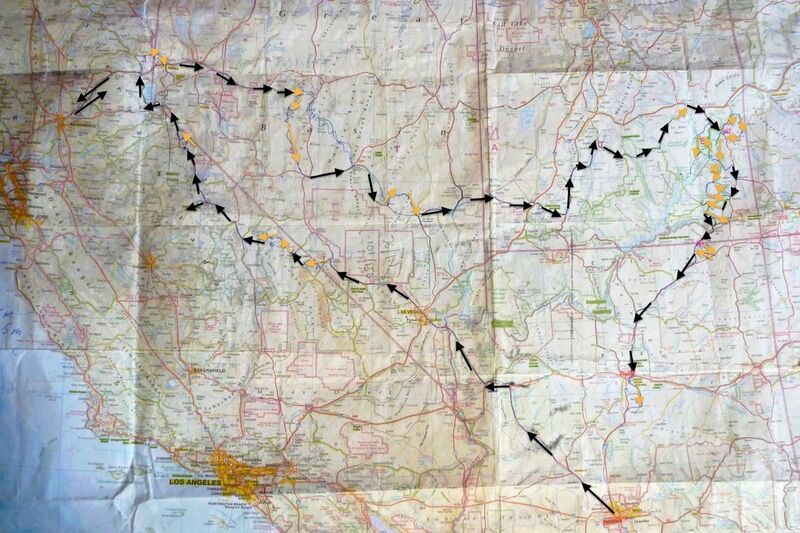 The last leg of my Southwest tour followed the southern UTBDR down to the Arizona border (map, right or zoom here) to arrive in time for the Overland Expo near Flagstaff in a few days time. 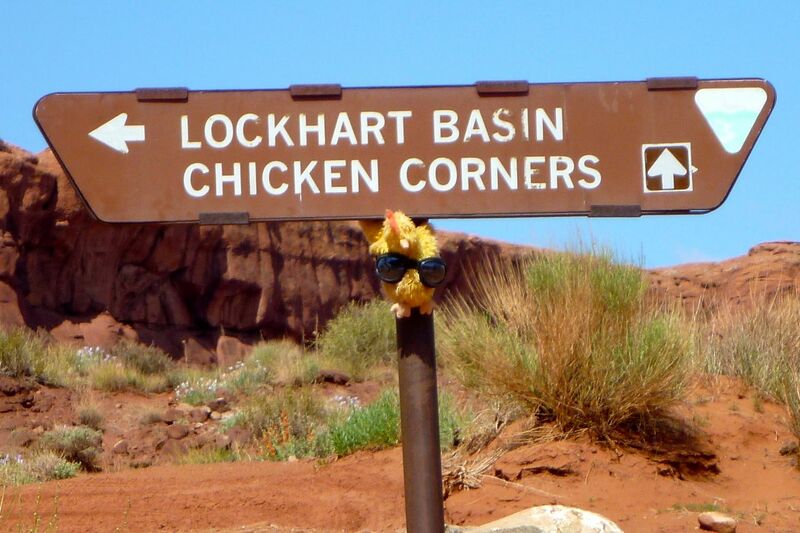 • The Lockhart Basin alternative route for experts only. 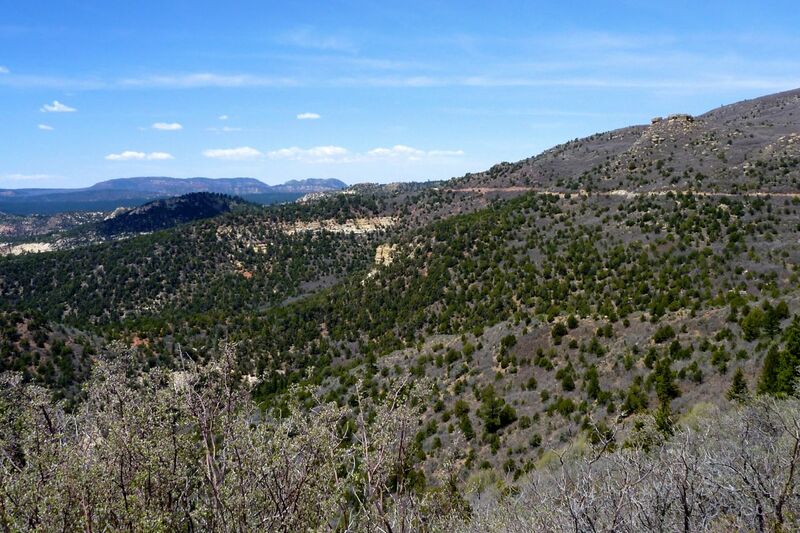 • From Montecello over the Abajo mountains, around Elk Ridge and back down to Blanding on the highway. 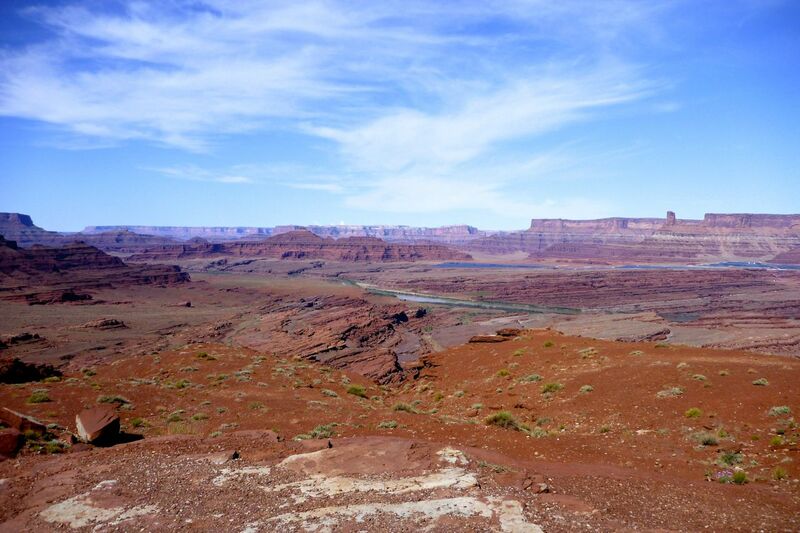 • Then over Snow Flats Road towards the Valley of the Gods scenic loop and the Arizona border near Monument Valley. 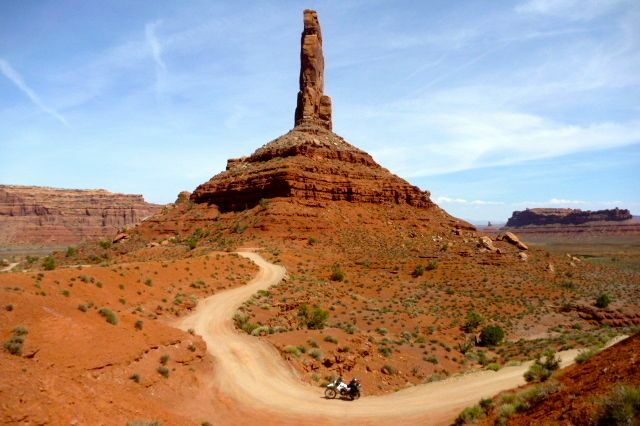 After a few days of rain in Moab, temperatures were set to soar again. 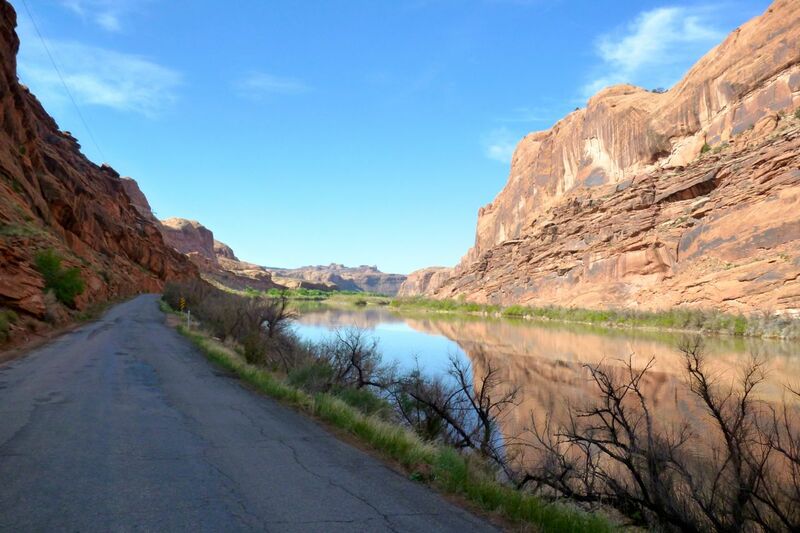 I set off along a road following the placid Colorado River. Lots of relatively lush camping spots up here in the first few miles. I rise to a pass and see the WRT and Island in the Sky on the far side of the river, with the blue Potash mine ponds below. 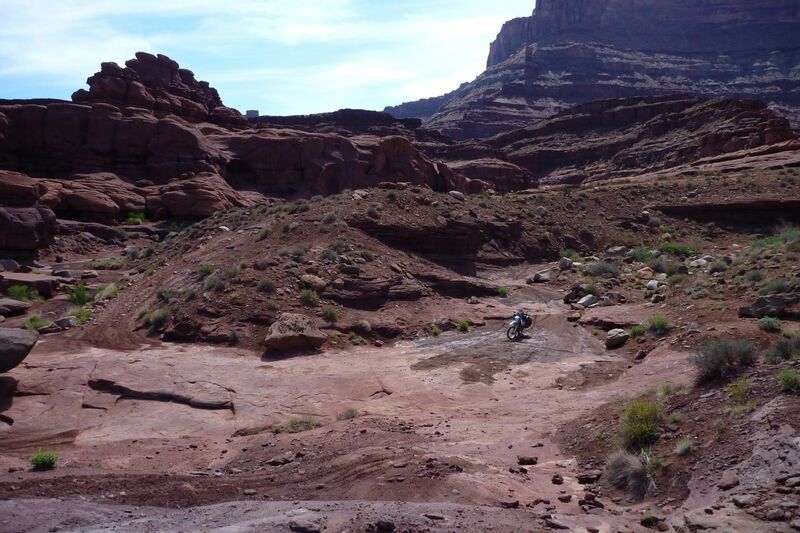 I’d waited in Moab for the rain to clear; it made the soft sand approaches no worse than this. The Lockhart track looks great on Google Earth. 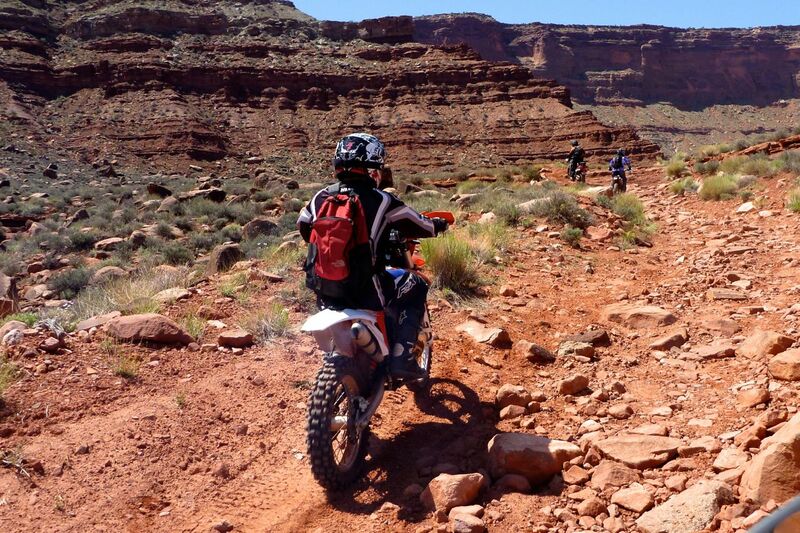 At this point, about 24 miles and an hour 15 out of Moab, you turn left and things get tougher. I didn’t know where to go, or should I say I didn’t believe where the tracklog was leading me, up to the left and into the cliff. Along this narrowing gully with plenty of rock steps to the bench up on the right; a GS12 would struggle here; an F8 with good protection might make it. 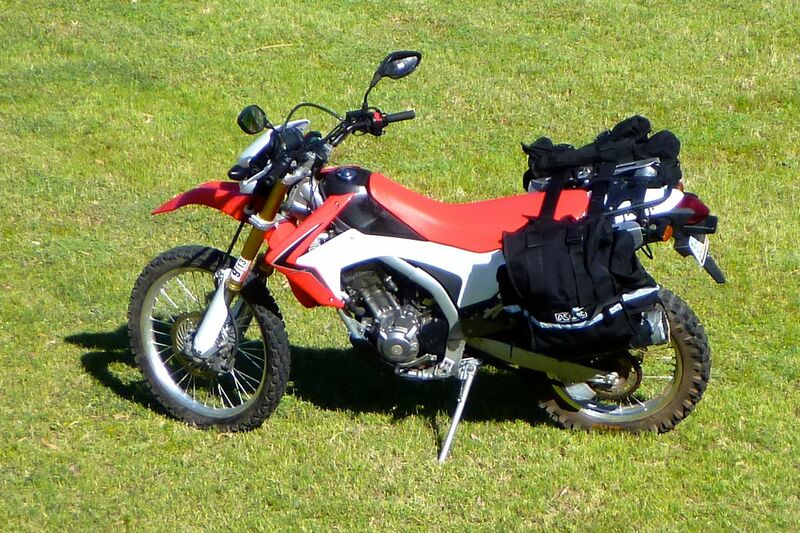 High gearing is hard on the clutch and side baggage limits options. Up on top I watched these dirt bikers from SLC also struggle to work out the right way. After some 30 mins they head in. 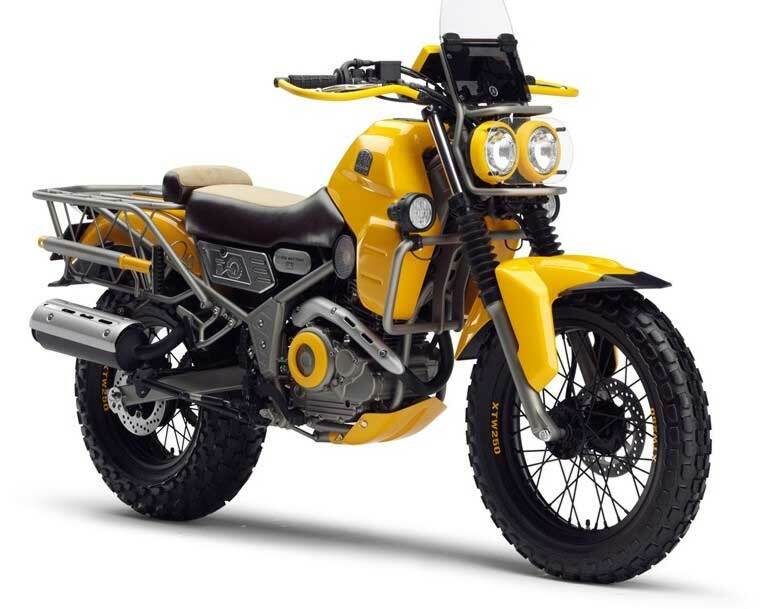 About half were on TW 200s; never heard of these being used as desert bikes but why not: low, light and easy to handle. With a bit of yellow paint you could make yourself a Ryoku from a TW. The rough terrain continues for 2 hours and 14 miles to Lockhart Canyonnorthside, with quite a few ‘one chance only’ launches up rocky steps and climbs. A regular, unlifted 4×4 would not manage here. Martin, one of the SLC guys shoots me. 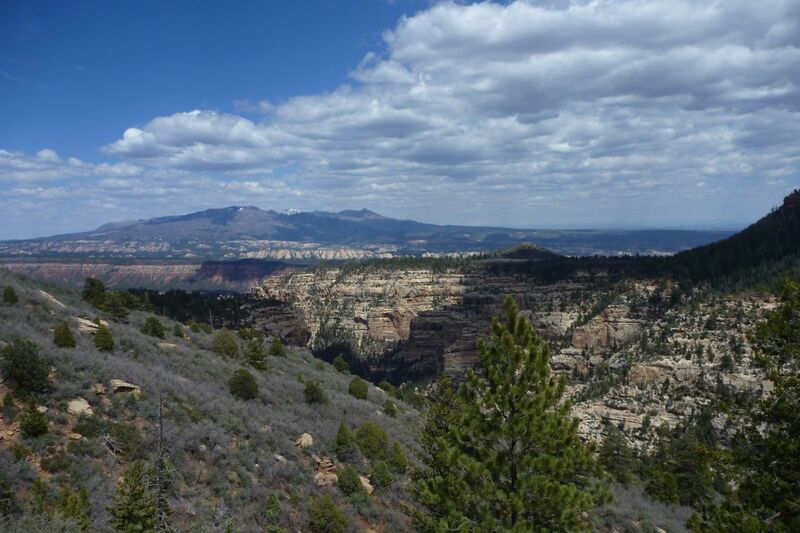 The north rim of Lockhart canyon is where things ease up. 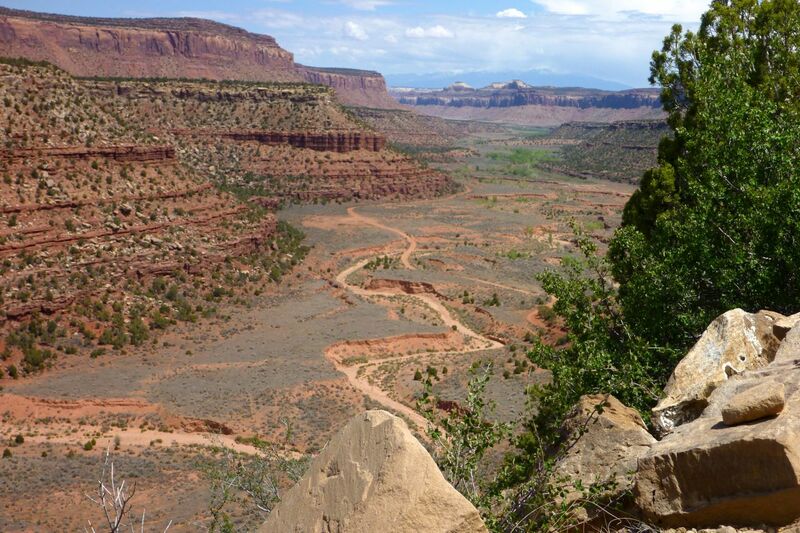 Another 24 miles and an hour 15 to the Canyonlands road. 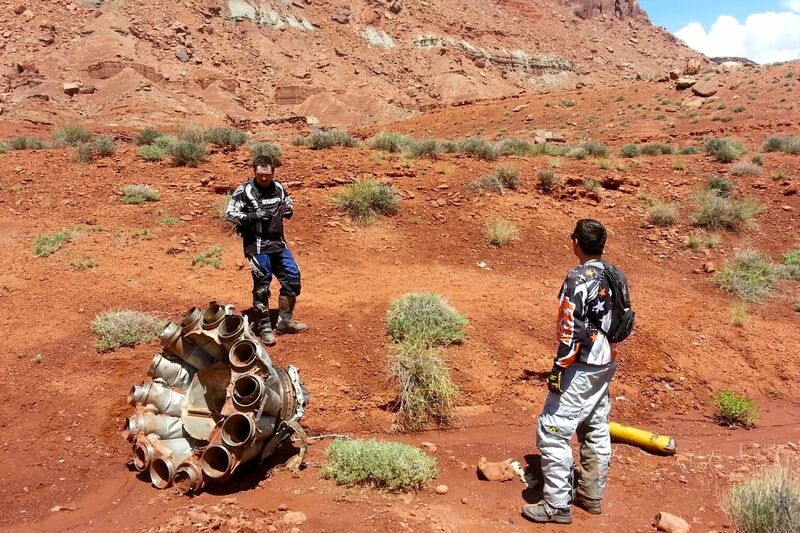 The SLC guys were looking for a T33 plane wreck from the early 1950s. They found it. Despite the recent rains, crossing Indian Creek was easy. 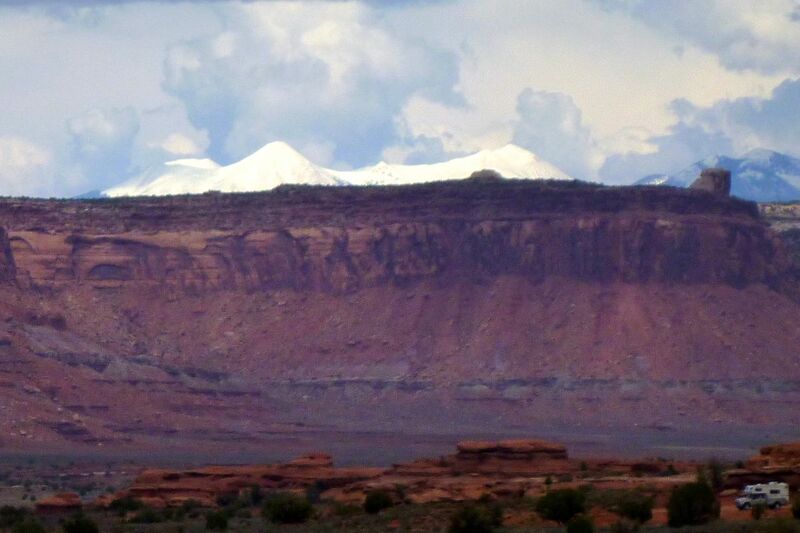 On the way west to the Outpost I’m surprised to look back and see what appears to be fresh snow on the La Sals. 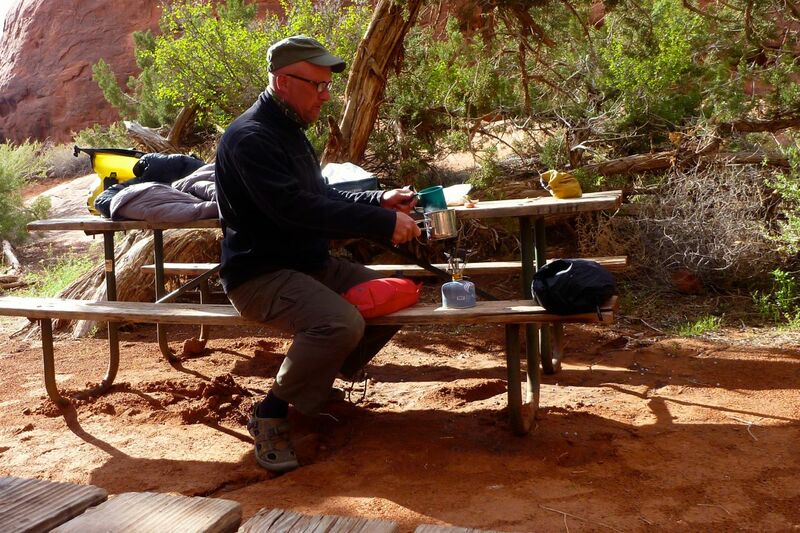 Time for a cup of tea at Canyonlands Outpost. A bench and table make things so much easier. 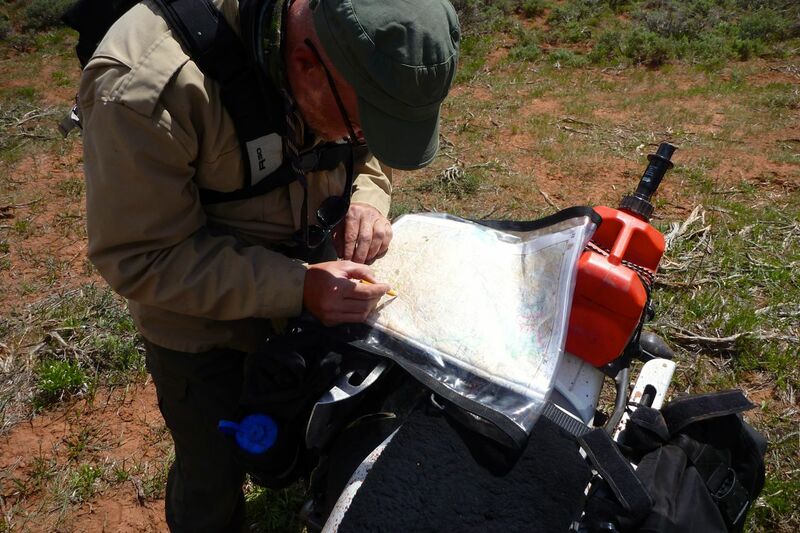 The Benchmark Utah Atlas showed a possible direct route towards the UTBDR as it ran west of the Abajo mountains round to Elk Ridge. It avoided the road section to Montecello where fuel may not be needed and was also a way around the Abajos, should they be snowed under or too muddy. 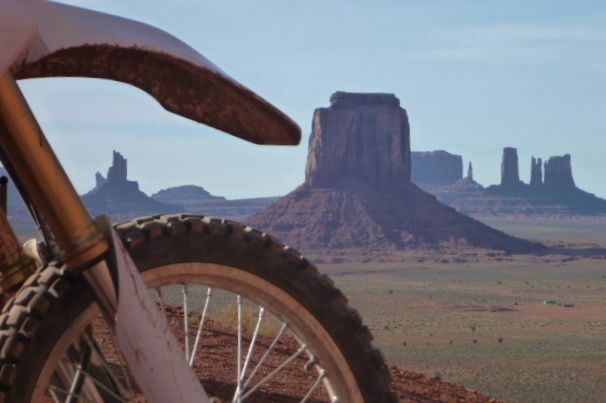 I took a day off at Canyonlands Outpost, and rode up North Cottonwood Creek to see if I could connect with the BDR. 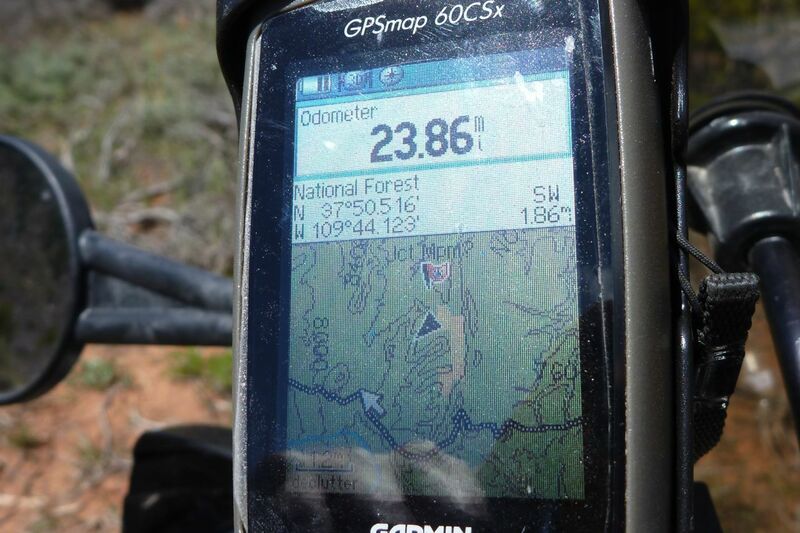 (If you want a GPS .kml tracklog for this route, it’s in this post). 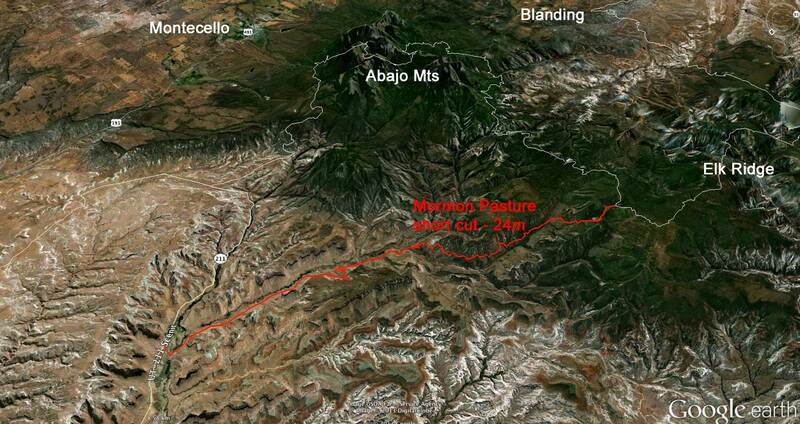 My planned route; one side of a triangle avoiding Montecello. Initially the track was wide but occasionally corrugated. 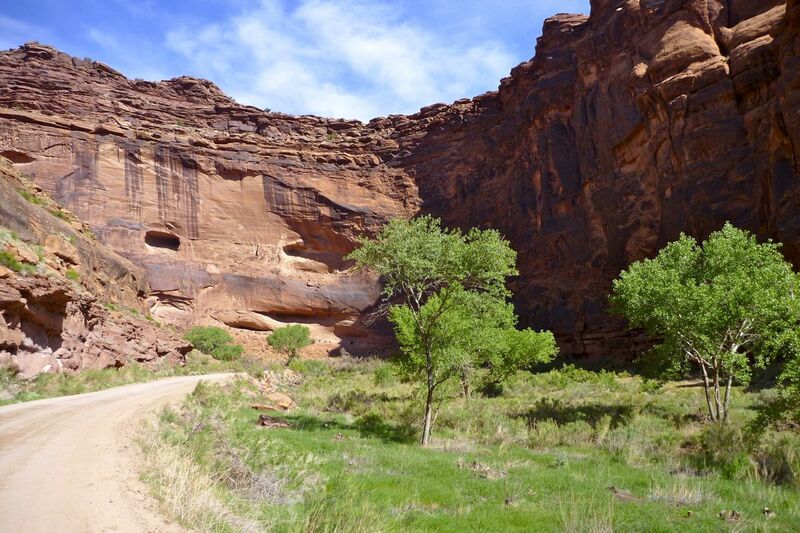 After 10 miles in you split left steeply down to the river and at the bottom keep right – soon you pass an old ranch house. Then up the side of Stevens Canyon, looking back on North Cottonwood Creek. 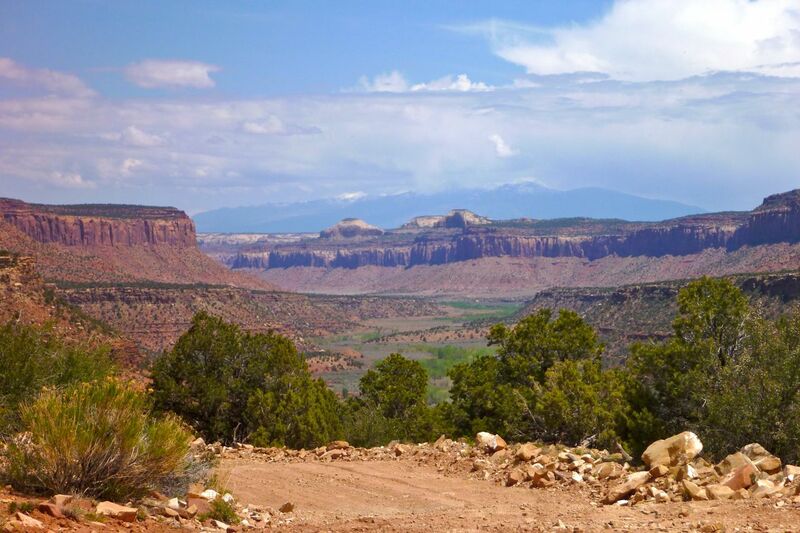 Great views back down North Cottonwood and the La Sals beyond. The track gets a little rougher, but in the dry nothing a 12 couldn’t handle. 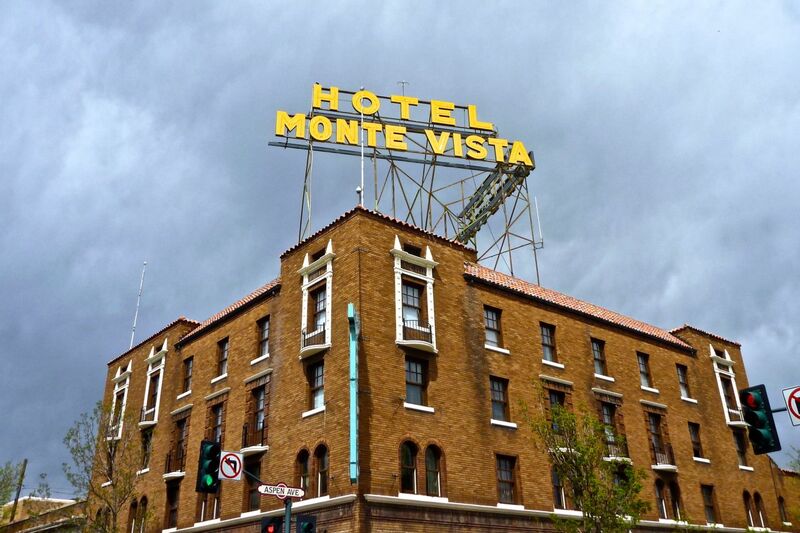 Was this Mormon Pasture Mountain – or maybe Round Mountain? Wherever I was, it was less than 2 miles from the BDR at the white arrow. 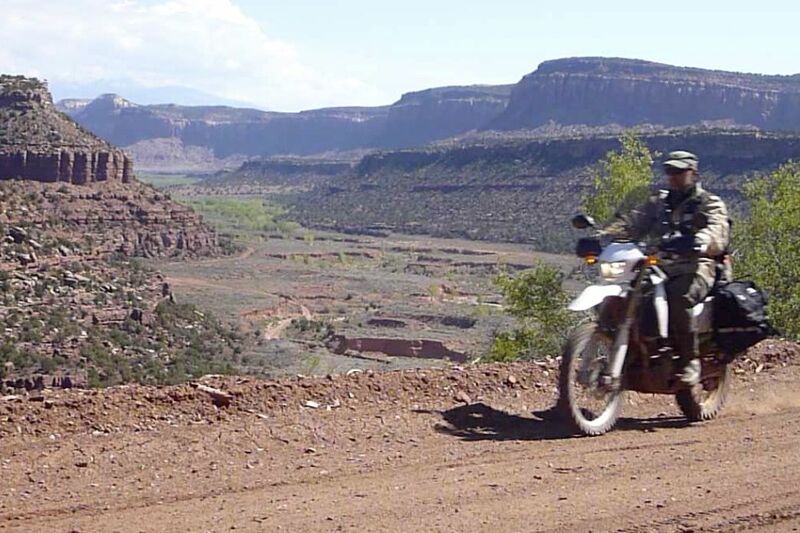 I ridden to a dead-end at a dry cattle tank below a high ridge. The good thing with Benchmarks is they have a lat/long grid with which you can plot your exact position off a GPS and work it out from there. Back down Stevens Canyon to the creek. 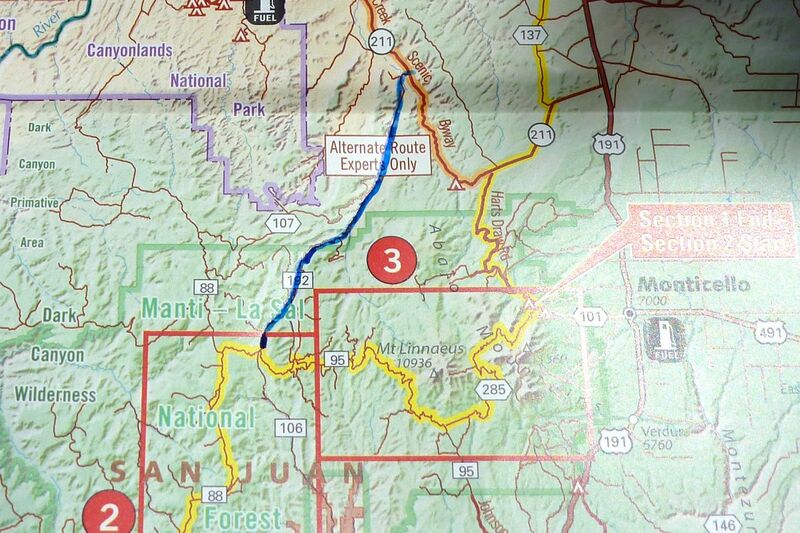 The route I took in red. 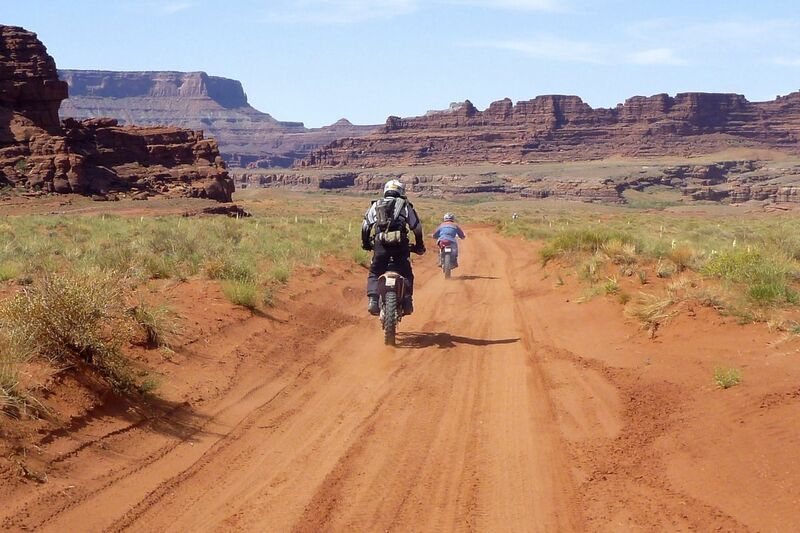 Kml file: http://www.adventure-motorcycling.com/Mormon%20Pasture%20Track%20Log.kml or see link above. Pleased my recce to Mormon Pastures had panned out, next day I headed down to Montecello. The L was a bit more underpowered tha normal; old fuel at the Outpost? You never know. 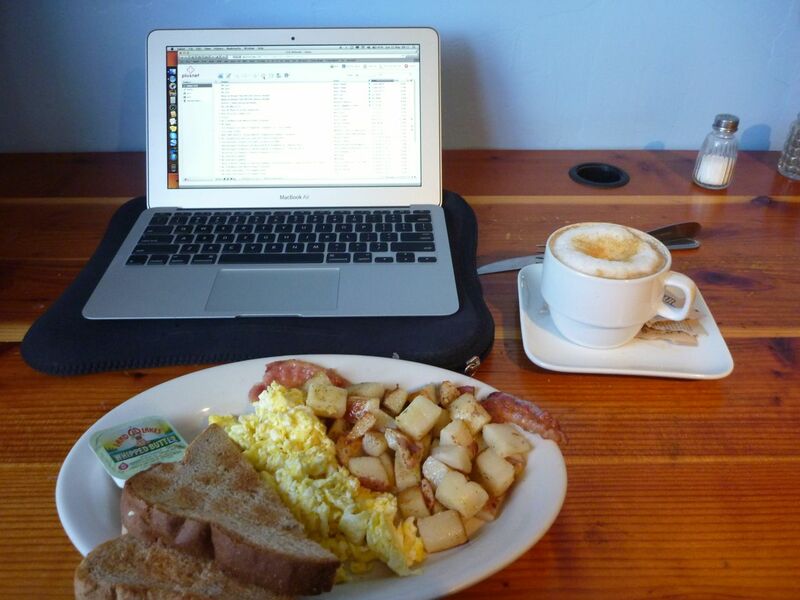 First stop, the Peace Tree Cafe on the north side for a breakfast or two. Out of town I turn onto the BDR and am soon up in the birches. The smell reminds me of Alaska and Yukon: rain, mud, insects. 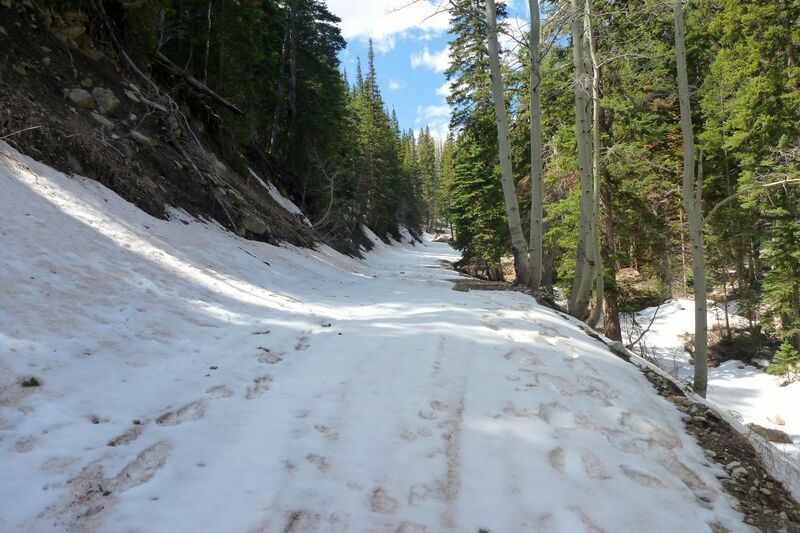 At 9300′ and only 8 miles from town a snow bank lay across a steep slope. 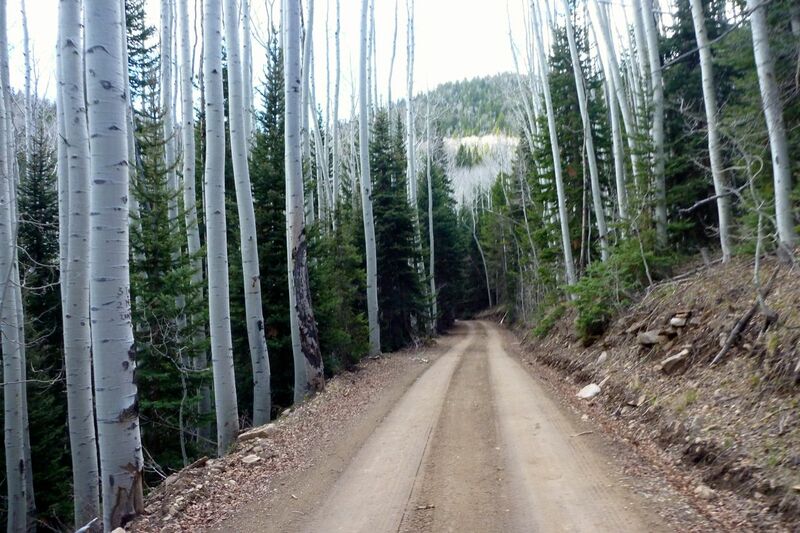 I walk on, panting; it clears but the Cooley Pass is another couple of miles at 10,000 or more. There’d be more snow for sure. 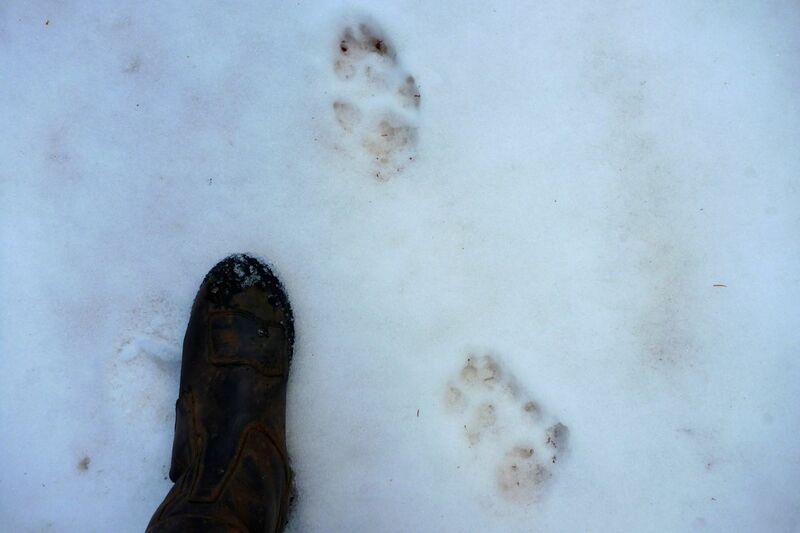 What I thought were small bear tracks. Apparently it’s something else – a big dog? I decide to turn back. 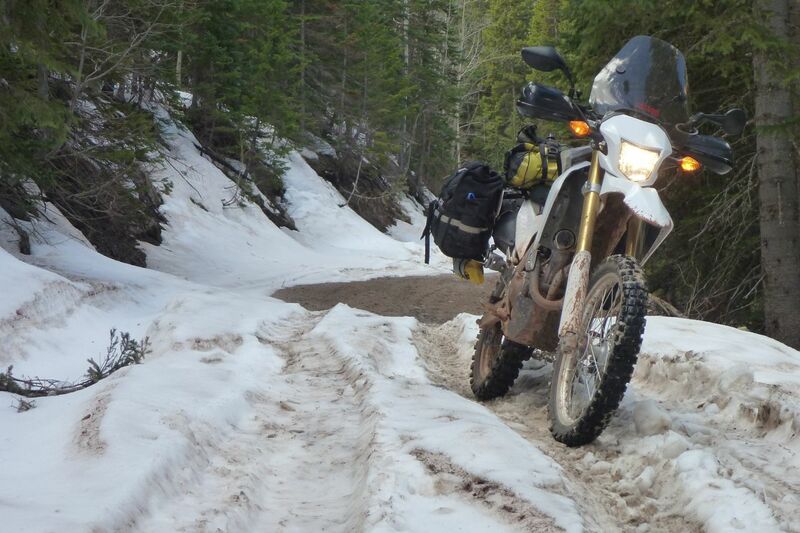 The thought of pushing the revving bike through the snow crust for who knew how long was too much like hard work. 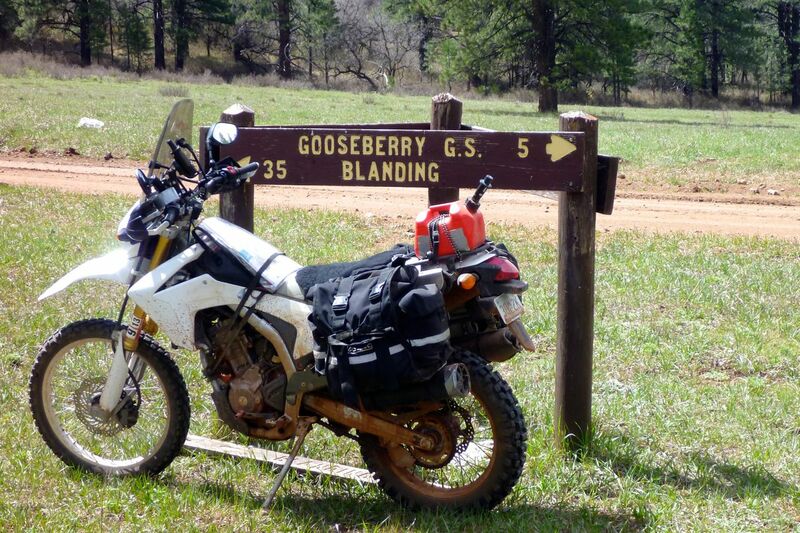 But there was no lower track around the Abajos, so I coast all the way back down to Montecello, take the highway to Blanding, dump the gear at a motel and after some trial and error find the way up to the sunny south side of the mountains to hook up with the BDR again. The track curves round a basin towards Elk Ridge in the background, a big loop out of Blanding populated by friendly Utes. 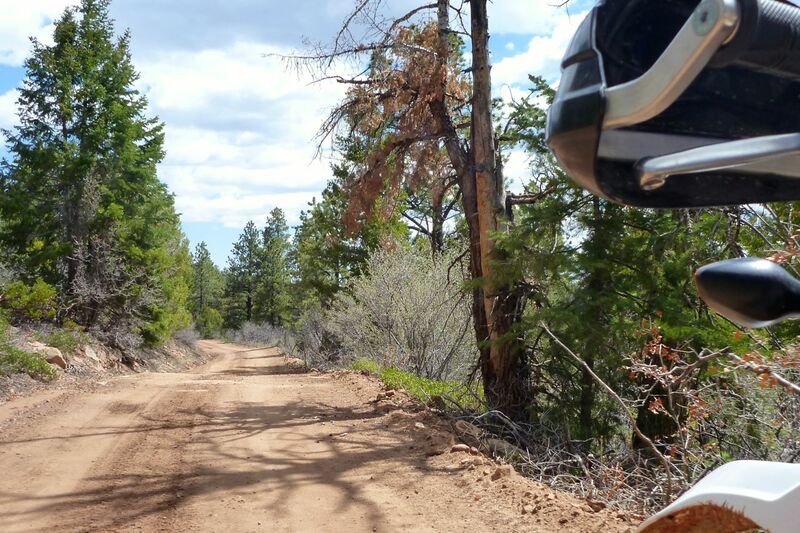 An easy dirt road was drying out, but annoyingly I fall off on some hard ruts, break a mirror and scratch the plastics. There goes the resale value! 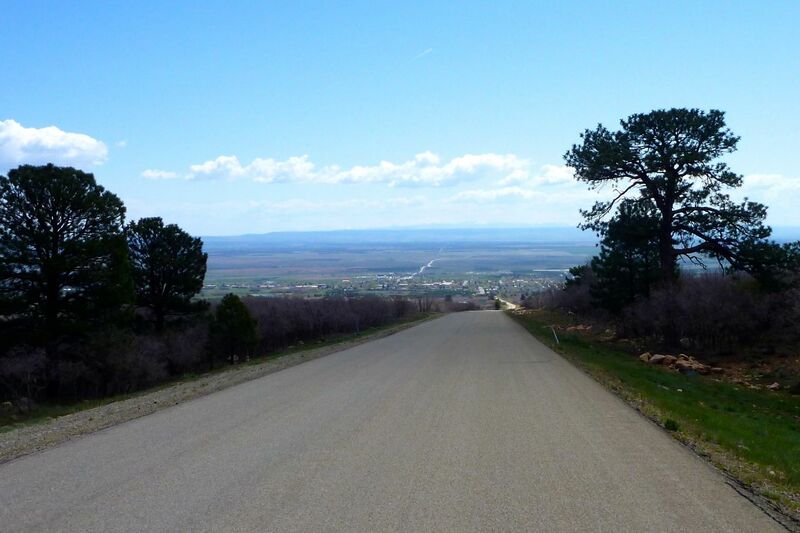 I pass the Mormon Pasture junction from yesterday’s ride and here am looking northeast at the Abajeros from Elk Ridge. After an hour I’ve got over the annoying fall and am back in the groove. Coming back off Elk Ridge towards Blanding, with the snowy San Juan mountains 120 miles away, behind Durango. 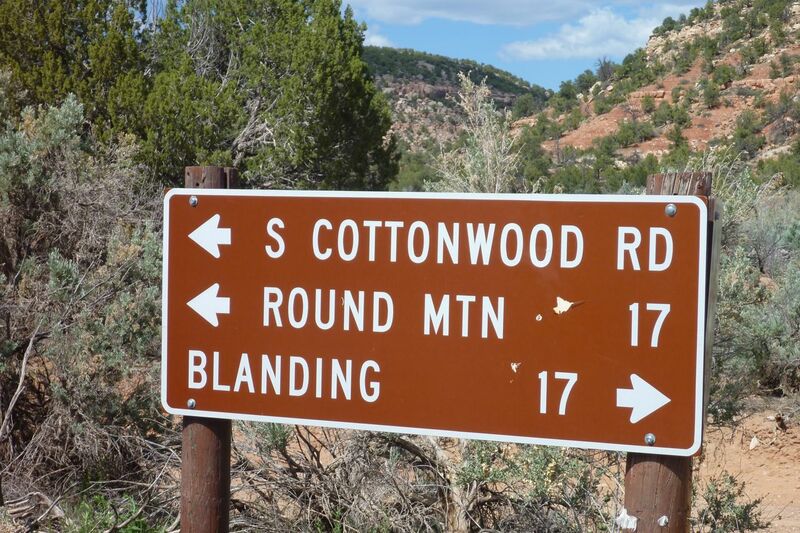 This sign shows that South Cottonwood connects across the basin up to Round Mountain and the Canyonlands turn off. 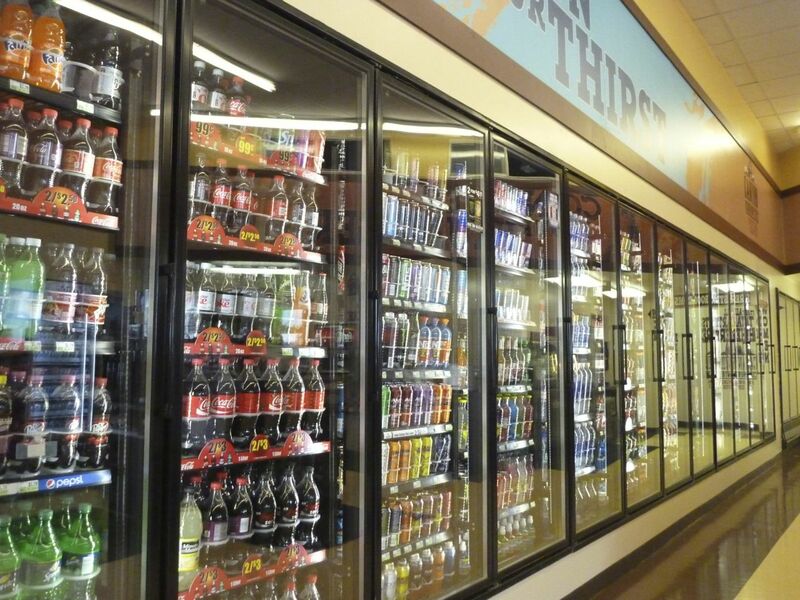 Back at the gas station I am staggered at the range of drinks – thee must be over 100 different types. And there are several gas stations in Blanding. This one also has a bowling alley. I don’t think there are any normal shops, the servo sells it all. 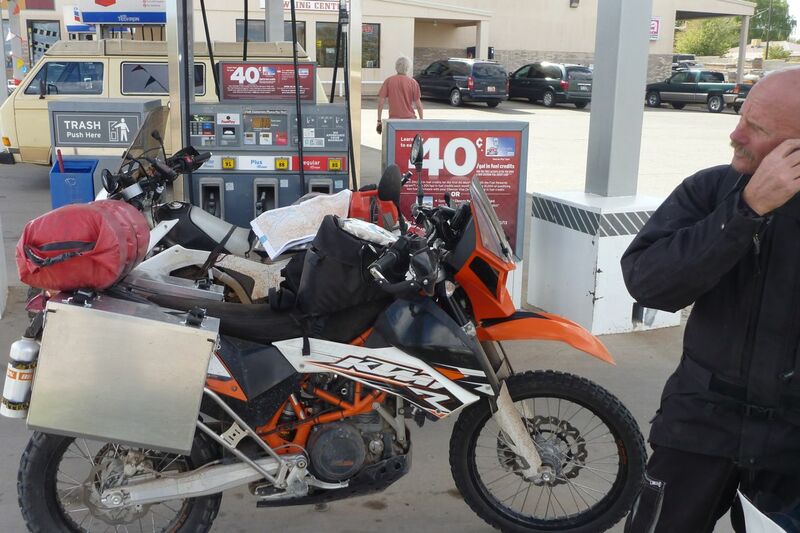 Fuelling up I meet this guy from Reno on a 690. He tried a lot harder than me to cross the Abajeritos that same morning from the south side but gave up too. So I did the right thing. He’s just cramming his earplugs back in as I start to drone on about how marvellously economical the 250 is. 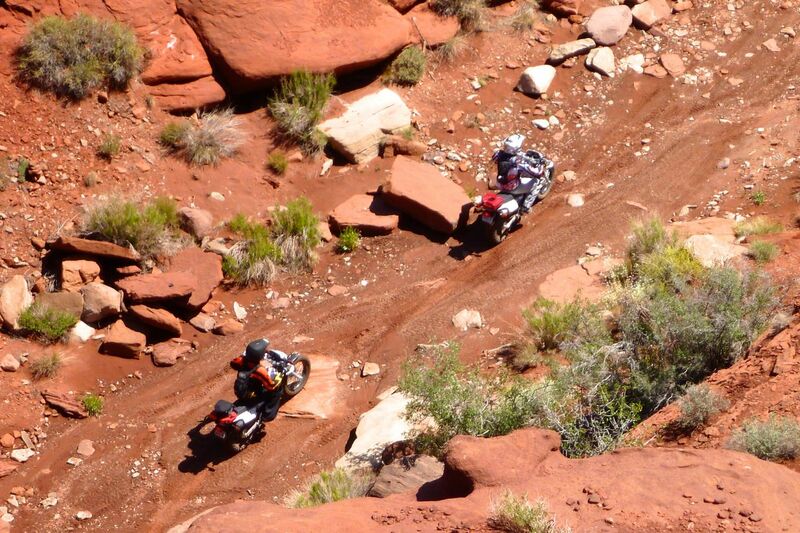 The last section of the BDR was set to be a hot day, with soft sand and bull dust on the menu, but spectacle right up to the AZ finishing line. 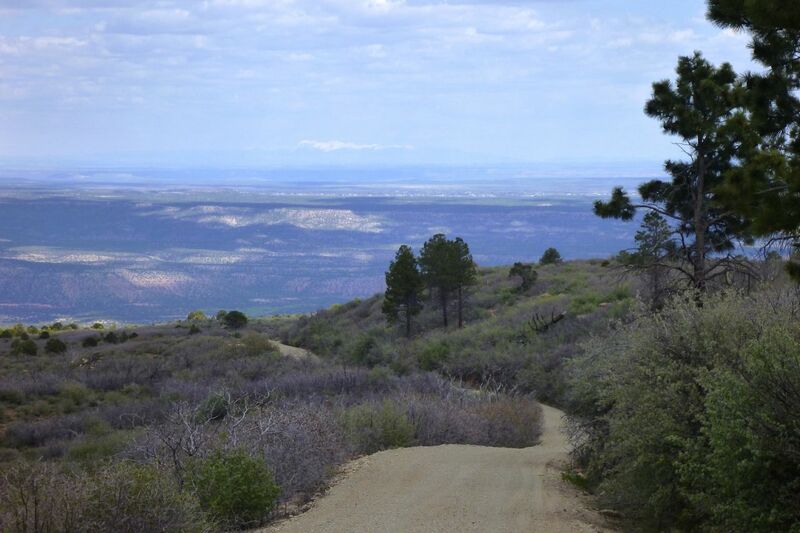 I take a parallel route to the BDR along Comb Ridge Road – easy enough, but the sand- and then the rocky rodeo over Snow Flat Road wears me out. 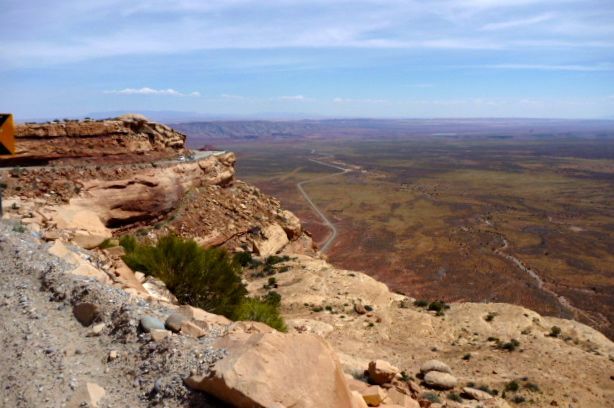 Coasting down Moki Dugway to the baking desert floor below. 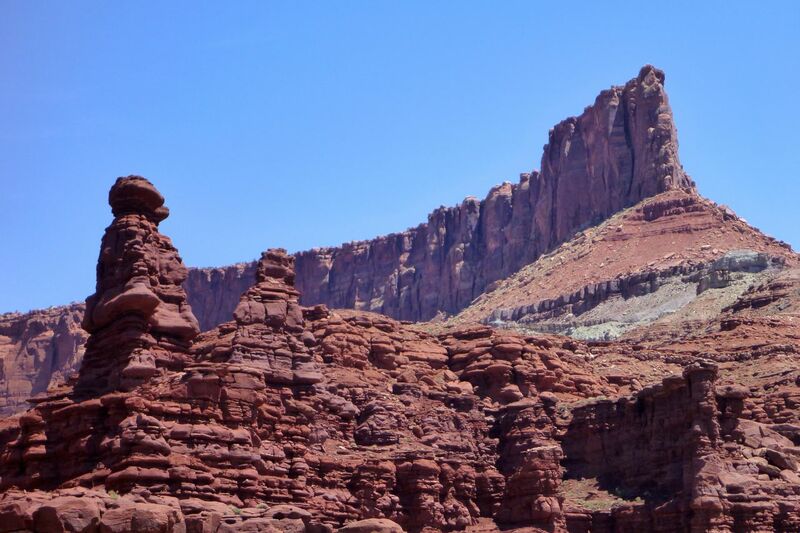 The famous pinnacle bend in the Valley of the Gods. As I leave I recall it featured in an earlier edition of AMH by Tom Grenon. 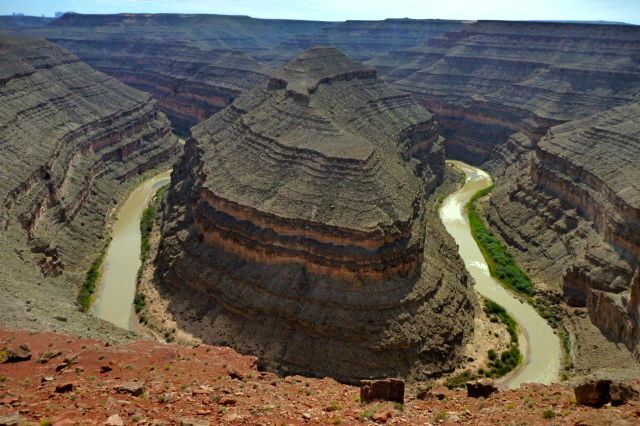 Checking in at Goosenecks – the awe-inspiring sites just keeps on coming. 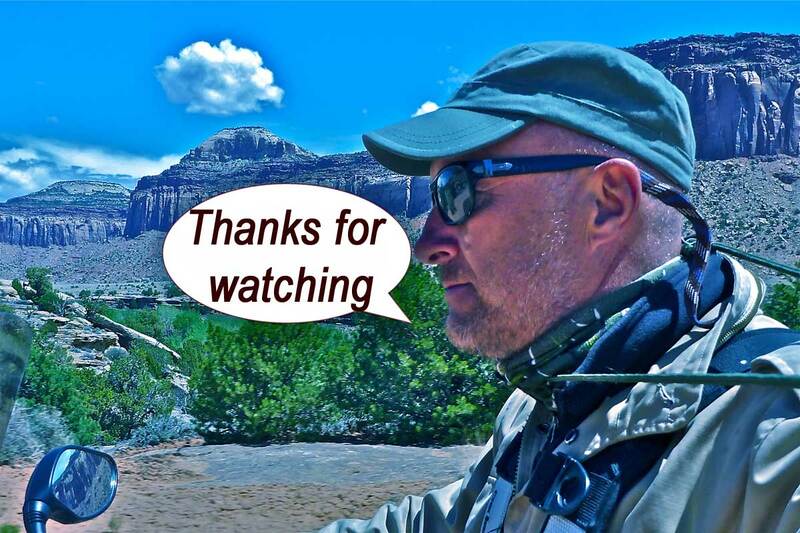 I head on towards the start and my finale of the UTBDR. 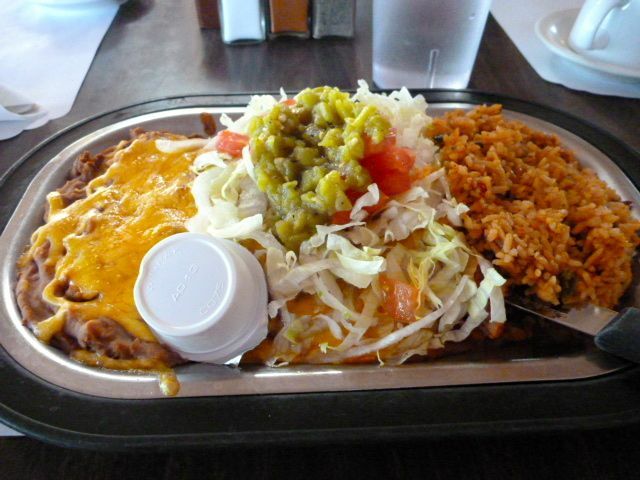 In Kayenta a rare sit down meal at a Navajo resto – but the motel prices here are nuts. So I ride on and as the sun sets pass through a violent bug storm. 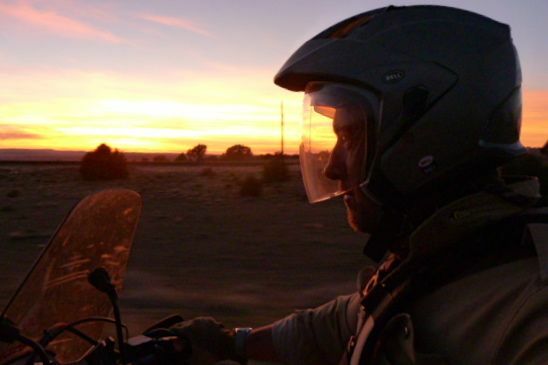 I am caked in insect entrails as they splat against me like gravel, but keep riding to Tuba City where I give in and settle on $125 for a motel. Occasionally you get caught out. 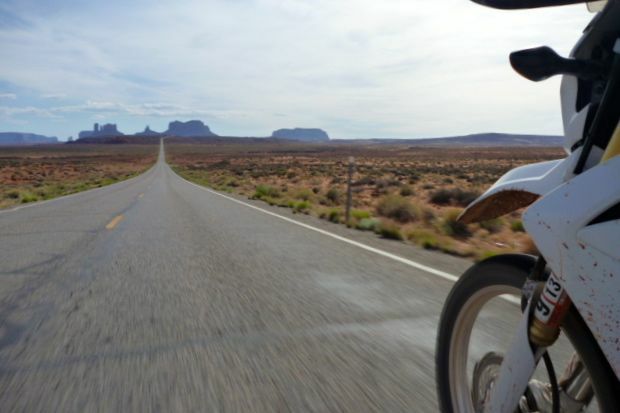 Next day is a short, 70-mile ride to Flag. 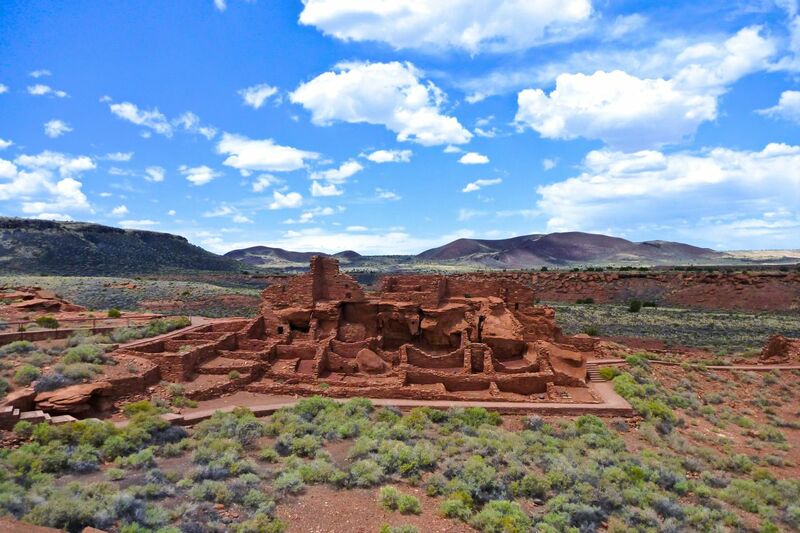 To string it out I detour via Wupatki ruins and Sunset Crater. 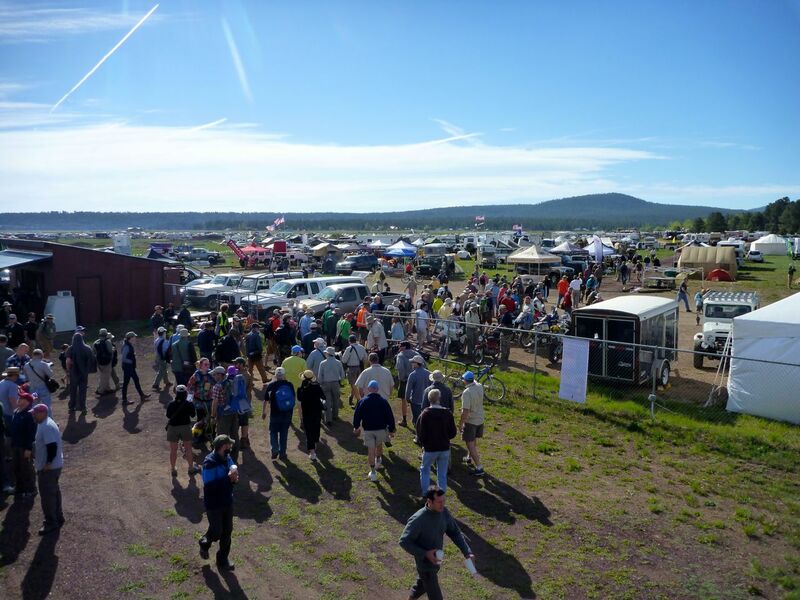 A couple of days later the crowds pour into the Overland Expo near Flagstaff. Austin Vince rocks up on a Touratech Sertao. He’d just been recce’ing the forthcoming AZBDR until he did his knee in. Show shown, talks talked and books sold. Back in Phoenix it’s 99F. After a month of trying I manage to sell the Honda with a total of 4200 miles on the clock for a good price just 12 hours and 22 minutes before my plane departs for London. 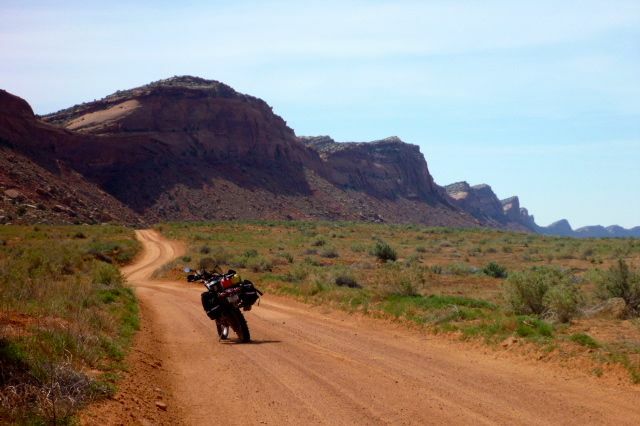 My 3200-mile ride through AZ, CA, NV and UT barely scratched the surface. 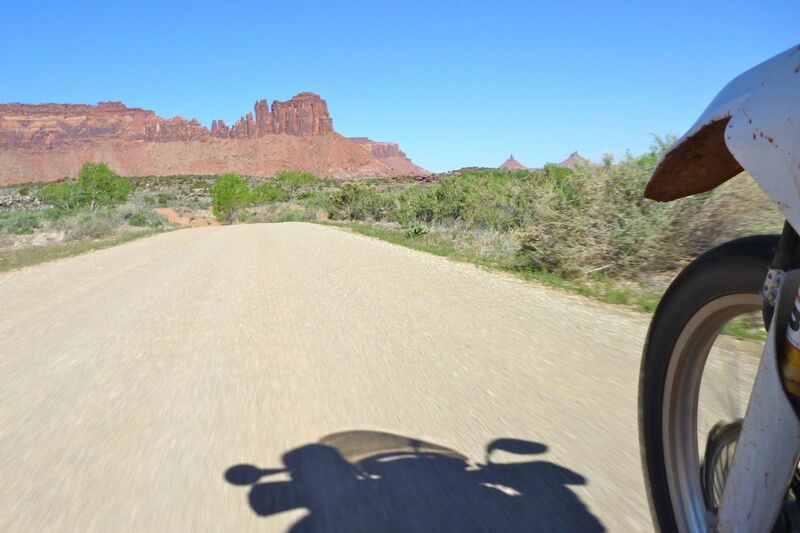 Tons more to see in all directions out here in the fabulous American West. 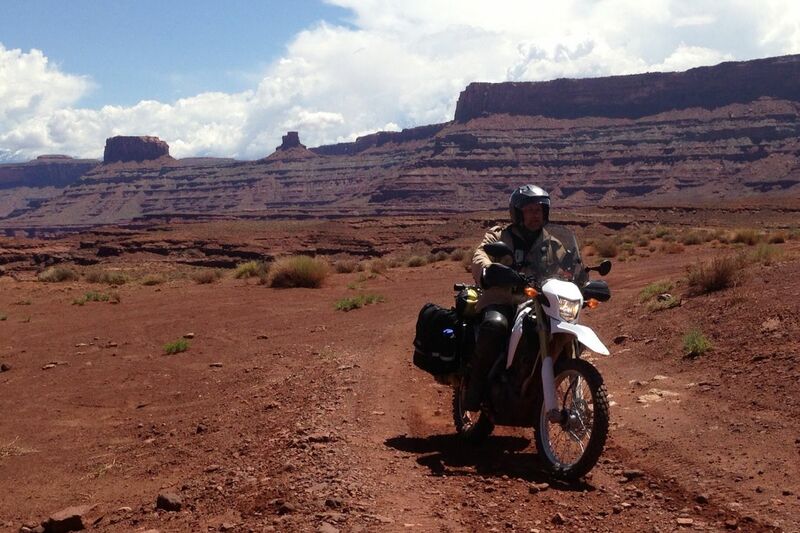 This entry was posted in AMH News, Project Bikes, Project: Honda CRF250L and tagged abajo mountains, Benchmark Utah Atlas, Canyonlands, cedar mesa, elk ridge, Honda CRF250L, lockhart basin, moki dug way, Monument Valley, mormon pastures, Overland expo, Snow Flat Road, southern Utah, Utah Backcountry Discovery Route, utbdr, Valley of the Gods, Yamaha Ryoku, Yamaha TW200. Bookmark the permalink. GREAT READ THANKS, THOUGHT YOU MAY LIKE THIS. I did get the AF Accident Report for T-33A # 50-374, which crashed on 6 September 1952 about 17 miles SSW of Moab, Utah, from Craig F. at AAIR. Thanks Craig. 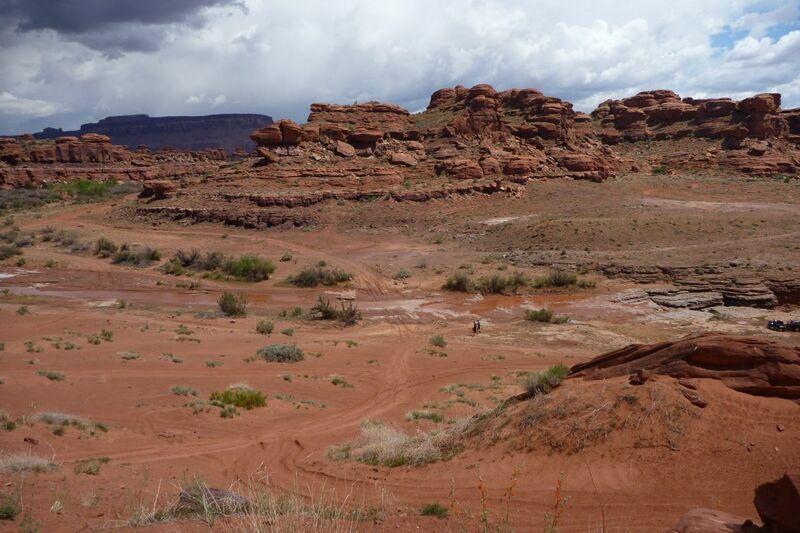 I first read about this wreck some years back in the popular 4×4 guide book “Canyon Country Off Road Vehicle Trails–Canyon Rims & Needles Area” by F.A. Barnes. He described a “battered tail assembly of a U.S. Air Force airplane once stood beside the trail…” I had looked for it once but had failed to locate the T-33. The accident report states that the airplane took off from Larson AFB, Washington, on a flight to Biggs Field, Texas, via Hill AFB, Ogden, Utah. The airplane was flying at about 35,000 feet when the front cockpit pilot, 1Lt. 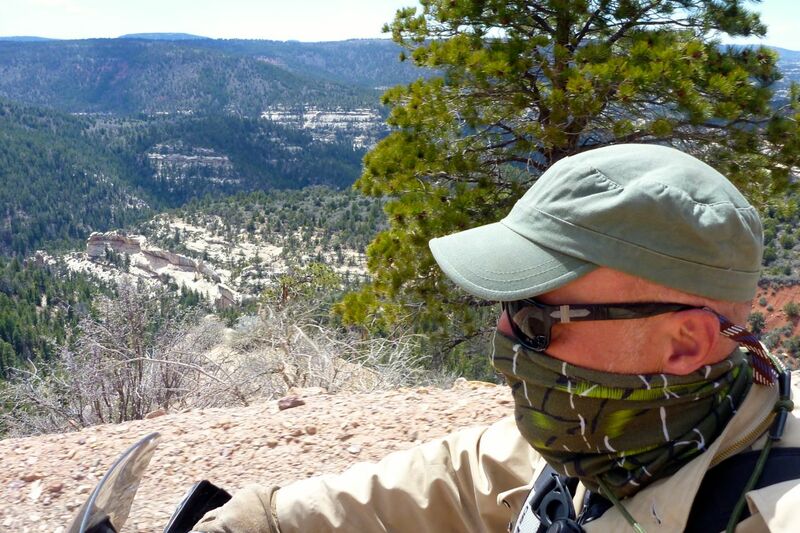 Donald Wingert, began experiencing hypoxia. The instructor pilot flying in the rear cockpit, 1Lt. David J. Harsh, dove the airplane down to about 23,000 feet and Lt. Wingert began to get back to normal. Lt. Harsh traded cockpits with Lt. Wingert after they landed at Hill AFB. The airplane took off from Hill AFB, headed Southeast and climbed back to 35,000 feet for the leg to Biggs Field. Wingert, now in the front cockpit, again began to experience hypoxia. Lt. Harsh dove the airplane to 20,000 feet and Lt. Wingert began to feel better and return to normal. At about 1310 (Mountian) Lt. Harsh began to climb the airplane back up to altitude when he heard a “rumbling” noise and felt a vibration. The engine then flamed out. Lt. Harsh tried three in-flight engine starts. The last one was a “manual” starting attempt. Apparently the turbine wheel had exited the aircraft and had seriously weakened the tail assembly. The second air start apparently started a fire in the tail section. The tail section failed completely and seperated from the aircraft after the third air start attempt. The airplane, minus its tail assembly, went out of control and spun wildly to earth. Lt. Harsh attempted to jettison the canopy. After a couple tries, the canopy would not release; he called to Lt. Wingert to help him jettison the canopy and apparently the canopy released when Wingert pulled on the canopy handle. Since the airplane was not equipped with ejection seats, Lt. Harsh was hurled from the cockpit by the extreme forces of the spinning airplane. After he was hurled free of the airplane, Lt. Harsh noticed that the tail section of the airplane was on fire. Lt. Harsh’s parachute deployed about 1,000 feet above the terrain. He steered his parachute to avoid landing in the burning debris field of the crashed airplane. 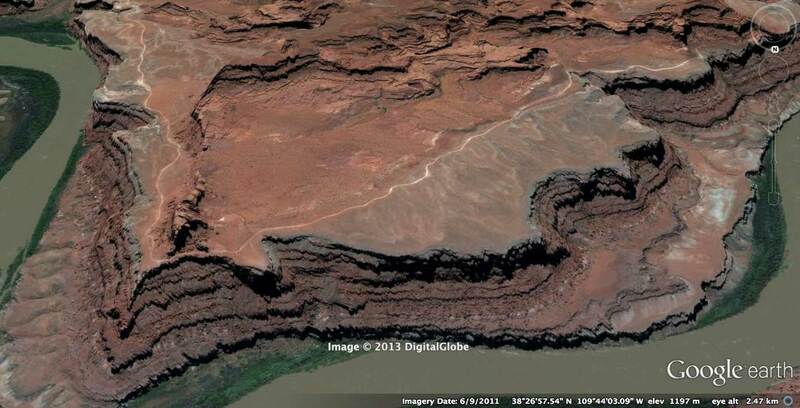 Lt. Harsh parachuted to the Canyon floor about 17 miles SSW of Moab, Utah. He had a seriously twisted ankle that prevented him from walking. Lt. Harsh spent the night under a rock overhang near the wreckage. 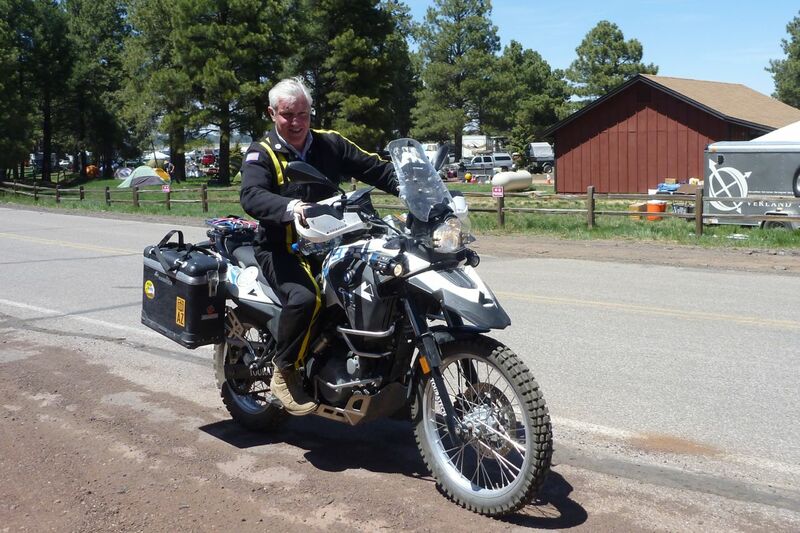 The next morning, Lt. Harsh was able to splint his ankle and began walking. Lt. Harsh found water in a small stream and began to drink. A short time later, a C-47 circled overhead and spotted him. 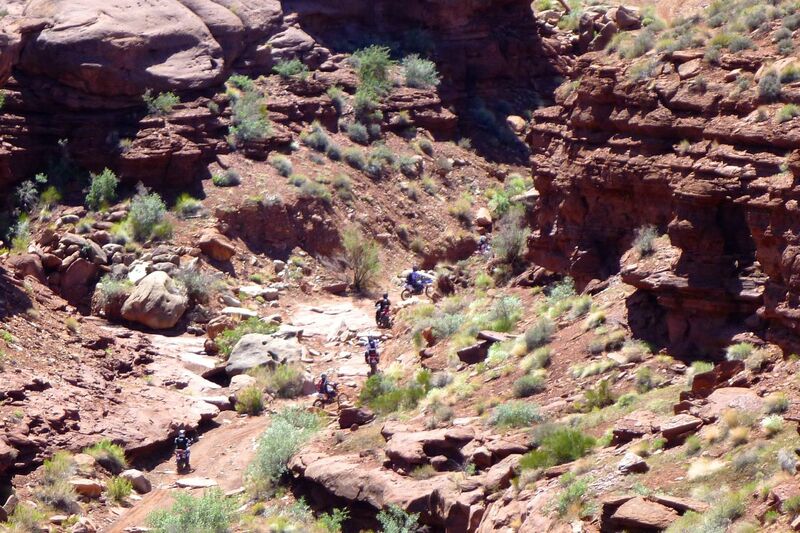 After a little while, he encountered two AF paramedics who had parachuted into the canyon for rescue. 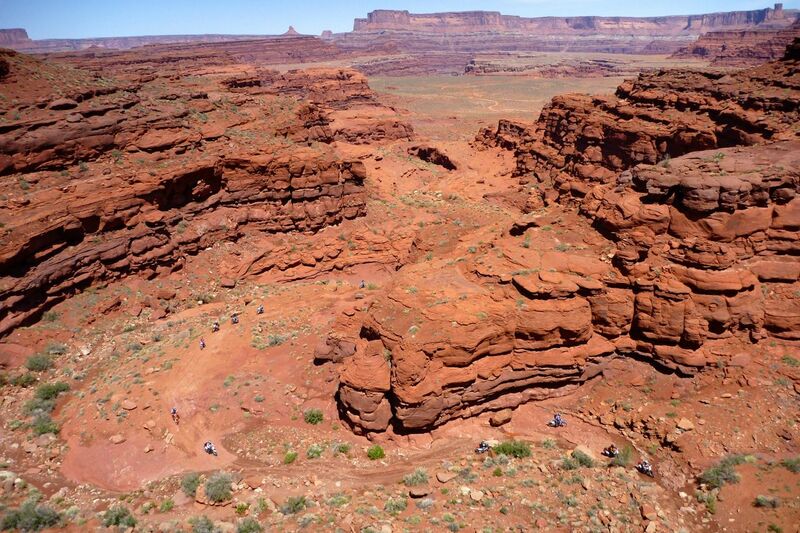 A small airplane was landed in the canyon and the pilot was evacuated to Moab and then to Hill AFB. Lt. Harsh was finally evacuated from the canyon about 27 hours after bail out. Lt. Wingert’s body was found near the wreckage. His parachute had not opened in time and he fell to his death. 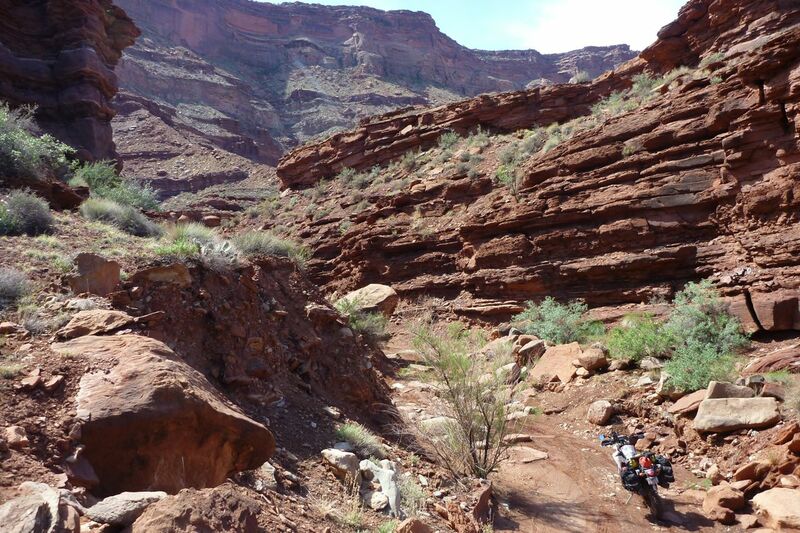 His parachute pack burst upon impact with the canyon floor. Investigators speculated that Lt. Wingert’s oxygen problems stemmed from an ill-fitting oxygen mask. Beautiful photos and a wonderfully written story. 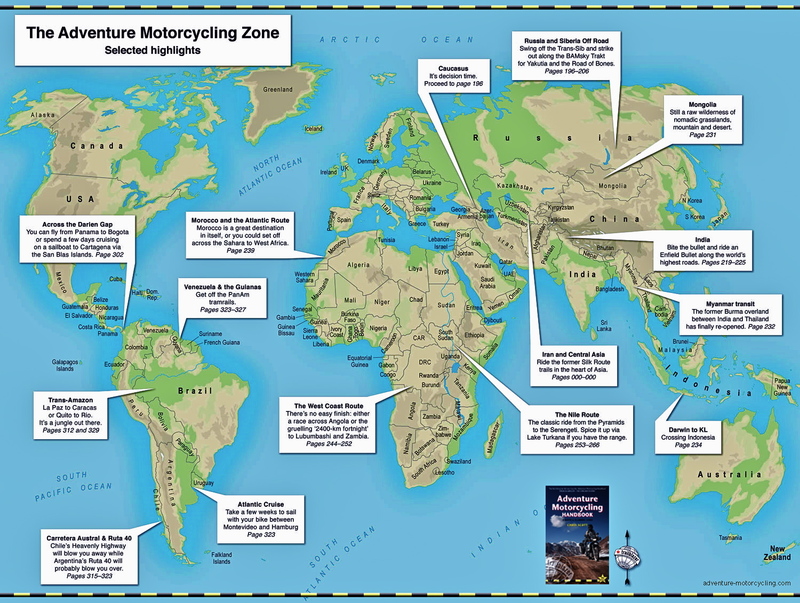 This is a valuable guide for those of us hoping to do the same ride some day. Thanks for sharing it! Just stumbled on this.A wonderful story, well written. A true adventure! Thanks for sharing. Hi, nice report. 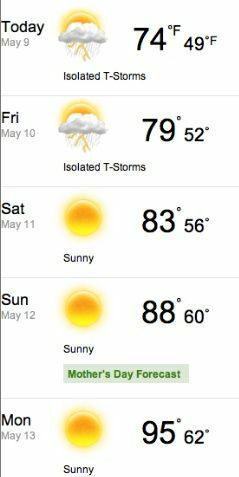 Sabine and I are really jealous. We would like to invite you to our web page CRF. But we stand just beginning to write down all of our adventures. 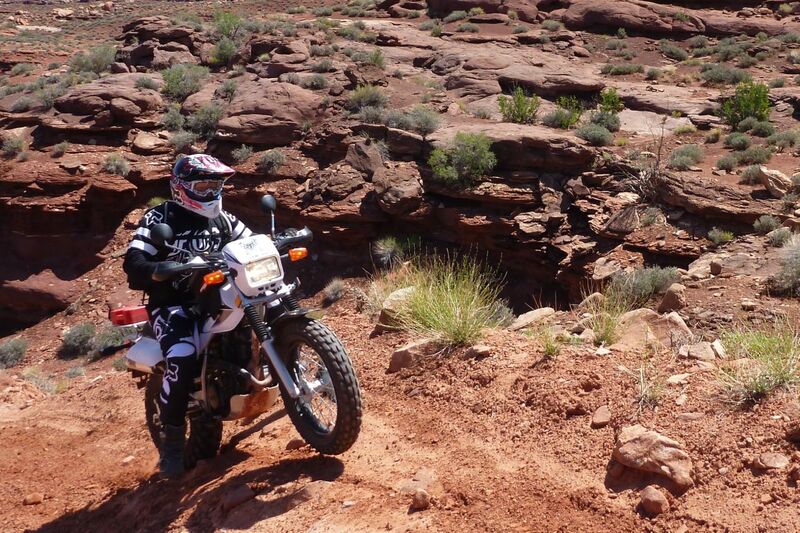 Well done, I am a firm believer in the capabilities of the smaller displacement bikes, will follow your next adventure? Thanks Dale. The bike got sold in the nick of time. 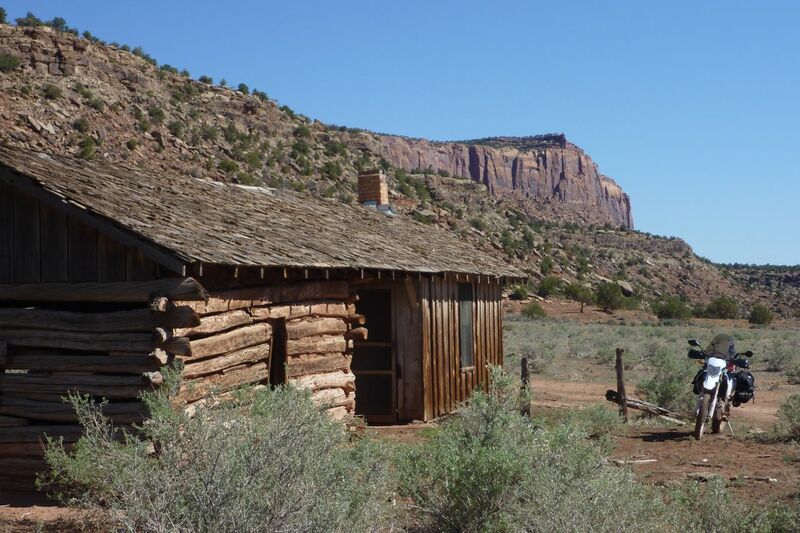 I was in Cedar Mesa but missed the ruins. Snow Flats road wore me out and it was a hot day. Plenty more to see out there! Great story! I ran into you at OX and tried to get the $$ together to purchase your bike. Unfortunately, couldn’t do it. 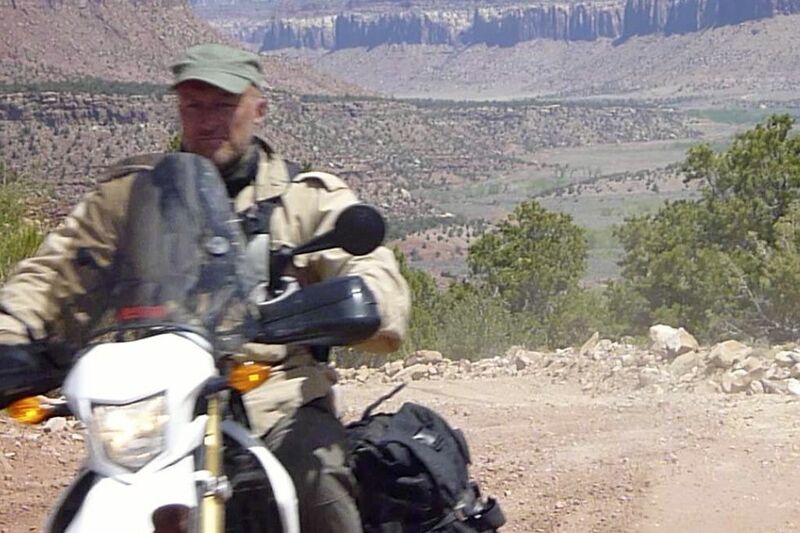 My buddy Kent and I hit many of the same spots you did in southern UT. 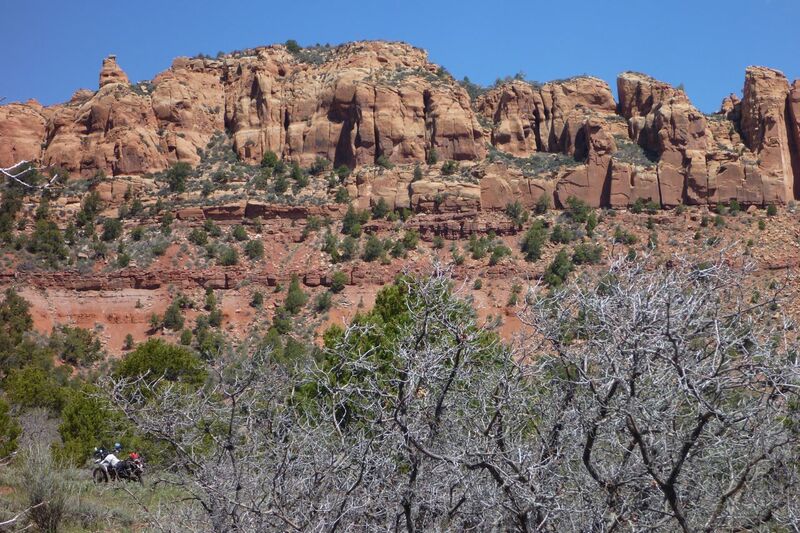 We spent a lot of time hiking into Anasazi ruins on Cedar Mesa. Give it a try next time you’re down there.